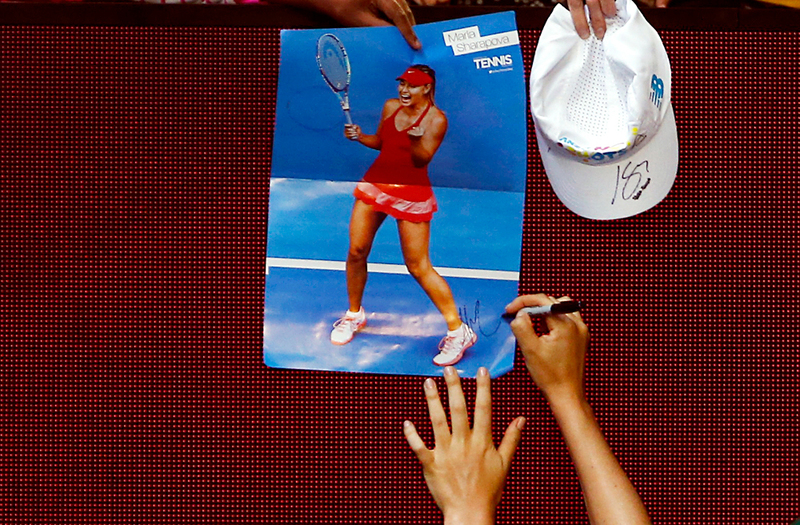 Russia's Maria Sharapova signs autographs after winning her third round match against Lauren Davis of the U.S. at the Australian Open tennis tournament at Melbourne Park, Australia, January 22, 2016. Russian Sports Minister Vitaly Mutko has accused the legal team of Maria Sharapova of not taking their responsibilities seriously after the tennis player’s two-year disqualification from the sport. Russian Sports Minister Vitaly Mutko has criticized the lawyers of tennis player Maria Sharapova, who was disqualified on June 8 for two years for doping by the International Tennis Federation (ITF). At a specially convened press conference in March, the tennis player admitted taking the drug mildronate – which was added to the World Anti-Doping Agency’s list of banned substances on January 1, 2016 – at the Australian Open two months earlier. "They wanted to play out the American scenario, like in Hollywood – to confess on air," Mutko said in an interview with the R-Sport news agency. "No, such things are not acceptable. The lawyer should draw his own conclusions. He gets hefty fees and should approach it [Sharapova's case] more seriously." Mutko also claimed that Sharapova's doping controversy is related to the crisis in Russian-American relations. "The lawyer (and the team) have chosen the option of confessing, playing to the crowd," Mutko said. "This isn’t acceptable now, because Russia’s ‘loved’ right now. As soon as the Christmas decorations were taken down, they came to Masha Sharapova to take doping tests. This indicates that they went to her deliberately, and the American lawyer should understand this." Sharapova's lawyers have filed an appeal against the ITF's decision with the Court of Arbitration for Sport (CAS) in Lausanne.